To write about this essay collection, I must first tell you about the format. Then finally a friend bought me this outstanding gift: a cassette-to-MP3 converter! Who knew! Thank you so much, Margaret; it was a shame to use it for just the two tapes, but hopefully the guy I passed it on to gets some use out of it with his old rock tapes. Anyway, I was finally, after years of ownership, ready to listen to my Stegner as I drove north across west Texas. And it is Stegner himself reading, which I think is a nice bonus, although he does have a bit of a somnolent monotone. The essays are not titled; he simply rolls from one into another, so that I was rarely clear on when one ended and another began, although changes of subject serve as loose guides. It’s an intriguing problem, the format of these essays and their absence from the world otherwise. I am a bit interested in transcribing them myself for posterity, if I could find the appropriate person to work with on that project. Hmm. Now on to the essays, yes? I enjoyed listening. Stegner has a lot to offer: he has known several corners of this country very well at several times in particular, and he specializes in detail and color (literally and figuratively, as in “local color”). He can be relied upon for commentary about conservation issues, and although his positions sound a little obvious in 2019, coming from 1989. His storytelling style is soothing, especially read aloud in that drowsy voice of his. I do wish I had these on paper to read and look at; as it was, I had to let the stories and reflections wash over me, which was pleasurable, but leaves me with less to say for this review. I made a few short recordings of lines that appealed to me. I have no idea what essays they are from. The Wasatch in Utah… taught me the feel of safety… A man can tuck back in against mountains, the way Hemingway used to tuck back into the corner stool at Sloppy Joe’s, his back covered and all danger in front of him. We manage to breed saints, brutes, barbarians, and mudheads in all sorts of topographies and climates, but what country does to our way of seeing is another matter, at least for me. By and larger I do not know what I like, I like what I know. I wish I had the line that came just before, too: his point was that topographies and climates don’t make people who are smart or stupid, moral or evil. It’s a point that’s important to me. People judged for their geographies is becoming a pet peeve of mine. And that last line: “I do not know what I like but I like what I know.” It makes sense somehow. Every night in season [the frogs] conducted love concerts that could drown out conversation even inside the house. Stamp on the patio bricks and they fell silent so suddenly from such a crescendo of noise that the silence rang like quinine in the ears, the sort of silence I’ve heard nowhere else except in the middle of the Amazon jungle. Silence rang like quinine! What an unexpected simile; and I’m not sure exactly what it means, not knowing what quinine sounds like in one’s ears; this is a line that I think would get picked apart by certain creative writing professors I’ve known, but I appreciate it. I don’t know what quinine rings like, but the surprise pleases me, and I’m willing to take it on faith that that was some silence, whew. Now, the Amazon jungle as a place of silence I trust a little less: I imagine a jungle being rather a noisy place, what with all the life going on there, the peeps and rustles and dripping that surely must be going on. But perhaps Stegner has been to the Amazon. I have not. There were other startling lines, and worthwhile observations. I wish I could share the text of these essays with you. Barring that, take my word for it, unless you have a tape deck and $16.48 (which will buy you the tapes right now on that other Amazon; more from AbeBooks). 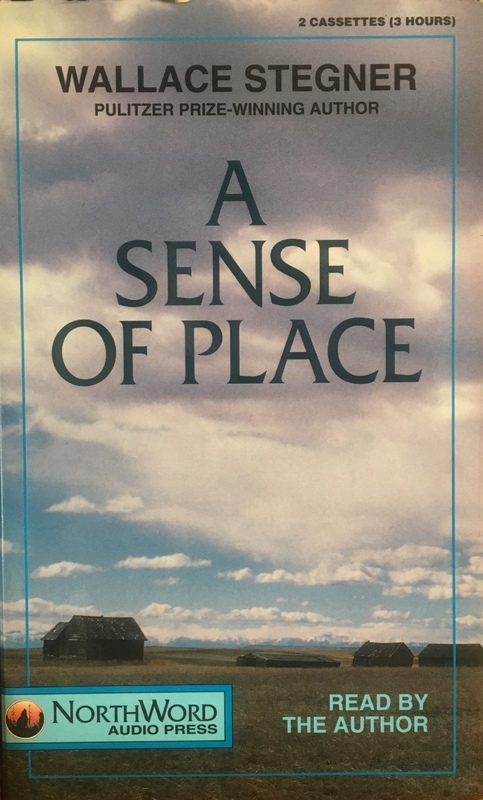 Even with all the hassles it took me to listen to A Sense of Place: worth it. So I think Stegner is observing the welcome & total feeling of relief from dissonant noise, just like malaria sufferers in the Amazon might have felt relief from quinine. I don’t know that quinine’s relief was that immediate, but it certainly worked; and it didn’t hurt that one could regularly salve the affliction by mixing Gin with quinine water. I knew all that, but it didn’t feel like a relevant reference to sound at all. I guess I can see that interpretation, though. I have a very old cassette player out in the studio. It is probably full of elder box beetles, but I just might need this set. I don’t know a lot of Stegner fans, which always baffles me, but I have loved his writing since I was a young Yankee transplant to the Northwest eating up everything I could from western writers. Thanks for sharing this. Wonderful on both counts – that you have the player, and that you’re interested! My work here is done. Thanks for reading, Ilona.